As a gamer, there’s nothing more important than comfort, especially if you’re a streamer. Streamers are sitting down for long periods at a time, and with a bad chair, that could mean lower back strain and discomfort. So, I can’t stress how important it is to invest in a gaming chair that’s going to keep you comfortable. 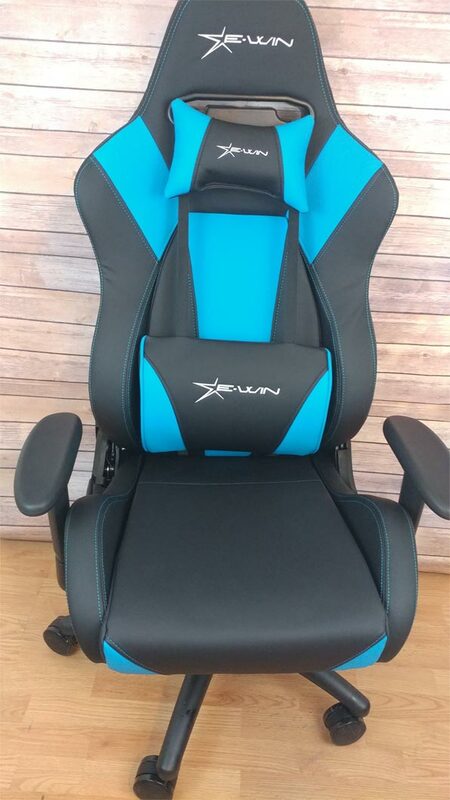 Enter the EWin Hero Series Ergonomic Computer Gaming Chair, a chair that’s built with those long play sessions in mind. It starts with a strong durable steel frame that serves as the chair’s structural groundwork. On that frame, E-Win added a super thick layer of cold molding high-density memory foam that adds the comfort. The final touch is the addition of the PU leather that covers the chair, adding the final layer of style as to not make the chair a visual eyesore. 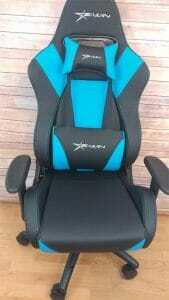 The final result is an impressive-looking gaming chair that’s comfortable as well. There are three colorways available: red, a cool blue, and lime green. The chair comes well-packaged, and it’s safely packed in foam and wrapped in plastic to protect it during shipping. If you’re ever put together any office chair, putting together the EWin Hero Series chair shouldn’t be challenging, as it’s the same process. First, snap the wheels into the five-star base. Then, put the hydraulic unit into the base and add the plastic cover over it. Once the hydraulic unit and its cover are in place, you can attach the back of the chair to the chair’s seat (simply remove the four bolts, line up the holes, and screw the four bolts back in). Of course, it uses hex screws (and yes, the hex driver you’ll need is included in the box). Once the back and seat are together, flip the chair over and attach the control unit by first removing the four bolts then lining up the holes and screwing those bolts back in. Once it’s attached, you simply turn the chair over and put it onto the hydraulic unit. Boom, your chair is together. The process took a total of 15-minutes for us to complete. As far as the chair’s features, you’ll find a lot of small touches that make this one of the better chairs on the market for its price range. First, it has adjustable armrests, so you can set them to the height best suited for your own personal comfort. All too often, chair manufacturers overlook the fact that not everyone sitting in the chair is the same height, so their arms aren’t necessarily going to be most comfortable with a default one-size-fits-all height. What’s more, the armrests are made out of soft PVC with some padding and not just hard plastic as you’d find in some other chairs. Secondly, the Hero Series features a reclining back, allowing you sit back and relax if you’re watching a movie or something a little less involved than playing a competitive game. It reclines in the same way a normal car seat would recline, with a side lever that you pull up until you’ve found the angle you’re looking for. In the comfort area, this chair leaves little if anything to be desired. The padding is soft enough to be comfortable but hard enough to give you support and structure. It’s clear that building an exoskeleton of sorts and adding padding over it is the way to go. Thanks to the added adjustable head and lower back pillows (that you can also remove entirely if you’d prefer, by the way), it’s harder to find an uncomfortable position than it is to find a comfortable one. My only gripe with this chair is a small one, and it’s that the wheels don’t work as well as they should. They don’t fully spin in every direction as you’d expect, and at times, it feels as though you’re dragging one of the five wheels in a direction it isn’t supposed to go in. It’s not something that’s always occurring, though, and you just have to catch the wheel facing the wrong direction for the way you’re moving for it to be an annoyance. The EwinRacing gaming chair might feel a bit pricey for some, coming in at $359 at the time of writing this. But, in reality, it’s not much more than a high-end office chair you’d find at, say, Staples or Best Buy, and it’s packed with features. If you’re looking for the perfect cross between comfort and style, the Hero Series Gaming Chair is a great choice. NOTE: This is a review post from Nerdmuch.